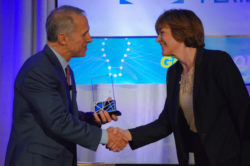 Martha Holley Newsome, President and CEO of Medical Teams International, receives the Global Impact Award from Craig Wessel, publisher of the Portland Business Journal. Martha Holley Newsome, Medical Teams International’s president and CEO, has been awarded the Portland Business Journal’s Health Care Global Impact Award. The award recognizes an individual whose leadership has made a global impact by improving health care practices in some of the most underserved places on earth. Newsome received the award at a Sept. 20 summit sponsored by the Portland Business Journal in downtown Portland, Ore. “Since taking the helm at Medical Teams International in September 2016, Newsome has emphasized swiftly bringing aid to where it’s needed around the globe,” the Portland Business Journal said, announcing Newsome’s honor. Since becoming president and CEO, Newsome has overseen Medical Teams’ responses to global health issues ranging from refugee health care, childhood malnutrition, pre-natal care, disaster response, as well as disease prevention,education and treatment. With nearly 1,000 staff around the world, Medical Teams serves more than three million people every year by providing health screenings, treating diseases, implementing hygiene programs and delivering life-saving medical supplies and medicine. Medical Teams also serves thousands of low-income Americans throughout Oregon and Washington through its Mobile Dental program. “The core of the organization has always been about helping displaced people who are deeply vulnerable, ” Newsome said in a companion article published by the Portland Business Journal. 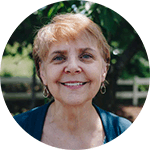 Prior to joining Medical Teams, Martha served as vice president of World Vision’s global sustainable health team and was the senior director of its HIV/AIDs initiative. Newsome has spent the past 30 years delivering medical care to people pushed to the margins. At just 33, Newsome served as a country manager in Mozambique in the aftermath of the country’s bloody civil war, providing humanitarian aid in a post-conflict situation. She’s spent more than two decades in leadership positions for international nongovernmental organizations, implementing high-impact programs that have served hundreds of thousands of people.